This gorgeous crochet cozy baby set comprises of three different parts: A crochet jacket with some matching boots and a lovely crocheted baby blanket. The crocheted baby set will make for a lovely gift to bring to your next baby shower. This pattern is written with instructions for how to make this beautiful crocheted baby set in 5 different sizes. The sizes included in the pattern are: 1 to 3 months, 6 to 9 months, 12 to 18 months, 2 years and finally 3 to 4 years. 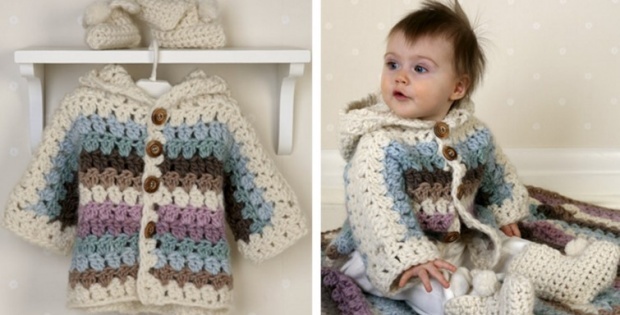 You can access the free pattern for this adorable crocheted baby set from Drops Design. To access the free crochet pattern for this lovely baby set, please click here: Cozy Cuddle Pattern.